I had a wonderful time at a paintout organized by Jim Quinn owner of Timberstand Gallery in the booming tourist town, Sandpoint Idaho. Sandpoint is not the same town of 40 years ago when I broke my leg skiing at Schwietzer, the local ski hill. I hit the midway station and wrapped my shin bone on the ski patrols first aid station. They thought an avalanch had hit the building. OUCH! Back then, it was a town of loggers and other hardy souls. Today it has been discovered by the wealthy and is becoming a destination resort with world class golf courses and high end homes and condos. I only hope they have an interest in decorating their abodes with quality artwork, especially mine. 10 artists from the US and Canada got together for 3 days to paint the town. 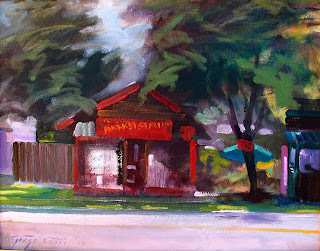 I counted 70 paintings finished for the last days reception and show put on during the weekly Friday Artwalk in which the town becomes a parade of patrons through displays of artwork around town. Quite a crowd filed through Timberstand Gallery. It was also encouraging to see a few sales. Jim puts on a great event. He engages the community. We painted at the Seasons Condominiums who went out of their way to make us comfortable. Painting in the direct sun on the beach the consierge provided bottled water, sun screen and even umbrellas. Later we had a private reception the tenants of the facility attended. The painting I did that day found a home with the 'penthouse' owner, a Ms. Kettle, who it turns out was quite familiar with the area I am from in Republic, WA, as her family is engaged in mining. Being the Summer Solstice lots of things were going on at the same time in another part of town . http://www.shopthefrontier/ put up their road show down at the Old Mill. 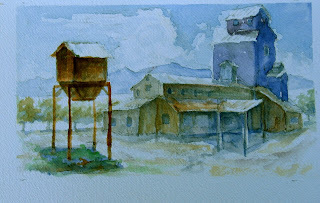 I did this little sketch of the old elevator which is something of a landmark in the town. Abandoned there isn't much farming going on around this resort town. The Arts Alliance was an interesting venue with demonstrations by sculptors and craftsman as well as a great band the "Kartel of Love" who played their own compositions which included a sax, trumpet, cello and even accordian. It was great to be surrounded by the energy of young people out to change the world. Reminded me of my long hair days. Seems each generation has a cause but they don't seem to change much, war and pollution. The same lines of protest repeated each generation. I'm certainly not being critical. Thank God someone is vocally opposing the war in Iraq and challenging the convention of our consumer lifestyle. 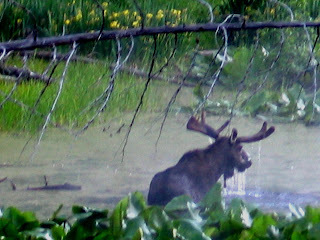 As I was driving to Hope, ID, I spotted this big bull moose in a slough. I stopped and got a few pictures untill he spotted me and the race was on for the car. I don't think he was chasing me just trying to figure out who was there as I was down wind and moose don't see too well. I didn't get to set up my easle but I got some great digital pics. Holy Smokes! Moose sure are big! This is what attracts folks to the area. Wildlife in your backyard, ski hill and the beautiful Lake Pend O'rielle, pronounced Ponderay. One of the first presence of the white man was the Hudson Bay Trading Post built by the famous explorer of the West, David Thompson who built the Kutunai Trading Post at Hope, Idaho. Today the post is memorialized by a granite monolith attesting to the white man's presence in 1809. Not very long ago. I guess the area could have easily been part of Canada if Hudson Bay had done things a little different. We've come a long way in 200 years and not all of it for the better. It is amazing to me that we have gone from what was a wilderness to our modern consumer lifestyle in so little time. Makes me wonder where we will be in another 200 years. I hear China is building a coal fired generator a day. Hope folks will be able to breadth by then. Young people singing their hearts out about the sad condition of the world, affluent tenants living in million dollar condos, the artist stands in the middle observing, not judging but noting the significant difference and ferreting out the substance of life as our life ticks away. The present becomes the past we wonder as Gaugain did "Who are we, where have we been and where are we going?" I'm heading out on an adventure to Dessert Isle of Maine to paint and drive horses. I've got my pochade packed with blank canvas and stocked up on paint supplies. I'm looking forward to maritime subjects and meeting new folks in a part of the country where there is plenty of history that is much older than that in the west.